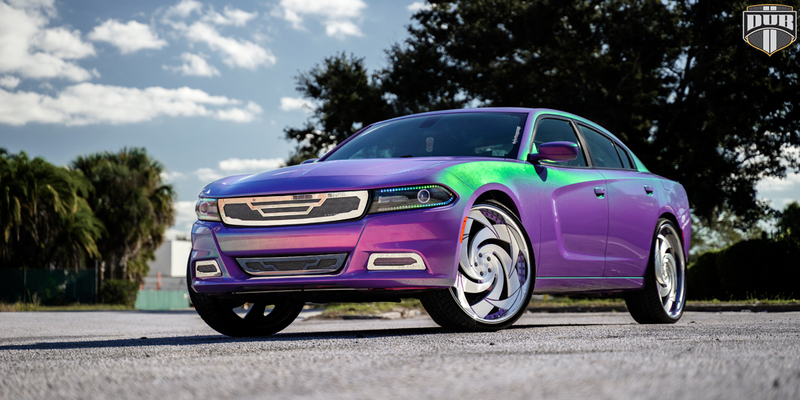 Change Colors with this Dodge Charger on DUB Wheels! The Dodge Charger might not be the most unique vehicle on the road in standard form. Aside from its Hellcat and SRT versions, it’s a bit basic in some regards. Well, this Dodge Charger knows how to grab attention with its two-tone paint, DUB Wheels, and other accessories. This Dodge Charger started out as your relatively average R/T model packing a stout 5.7-liter HEMI V-8 engine with 370 horsepower at 5,250 RPM and 395 lb-ft. of torque at 4,200 RPM being sent to the rear DUB Wheels. It was quickly transformed into a one-of-a-kind cruiser. The entire body was covered in a special color-changing vinyl wrap that is either Purple or Green in certain angles or light. A new front grille and mesh is flanked by new headlights and matching Green LED daytime running lights. The suspension was also lifted and modified in order to accommodate for the new XXL-sized DUB Wheels. The final touch was a new set of custom DUB Slasher – X102 rims. 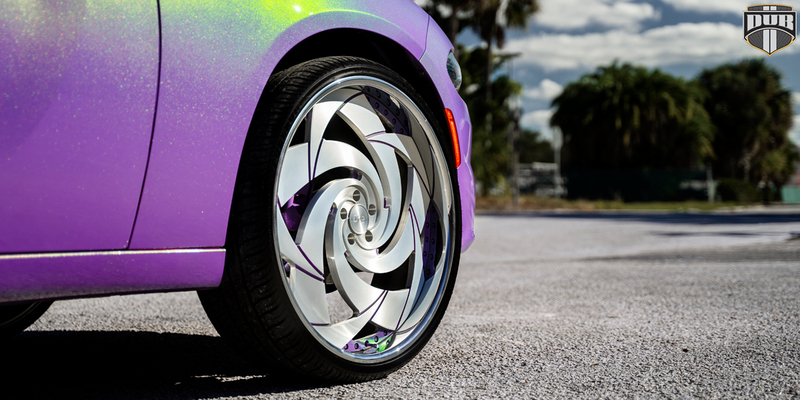 These five-spoke DUB Wheels feature a twisting pattern and a deep polished lip. 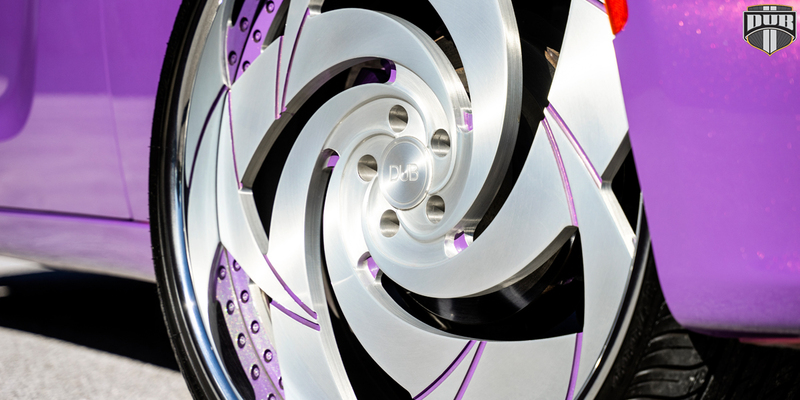 The spokes cut into each other for a special and dramatic finish, and feature body-matching colors along with the exposed hardware. 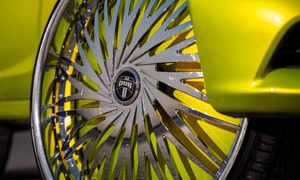 The new DUB Slasher – X102 rims also boast a Brushed finish on each spoke that helps contrast the vibrant colors. 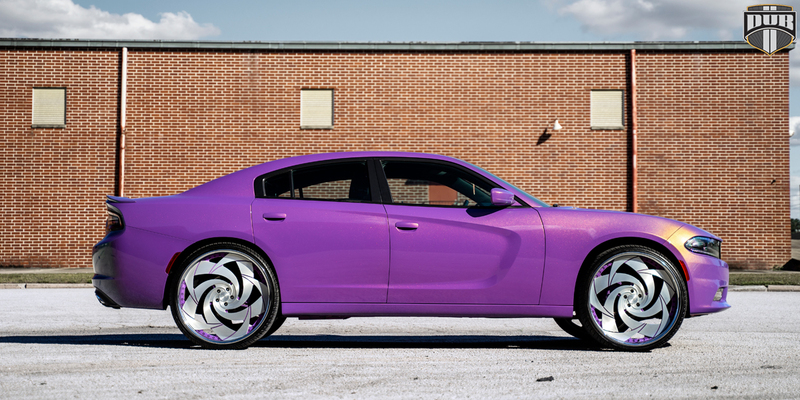 In a world where attention can be everything, this Dodge Charger with DUB Slasher – X102 wheels is king. 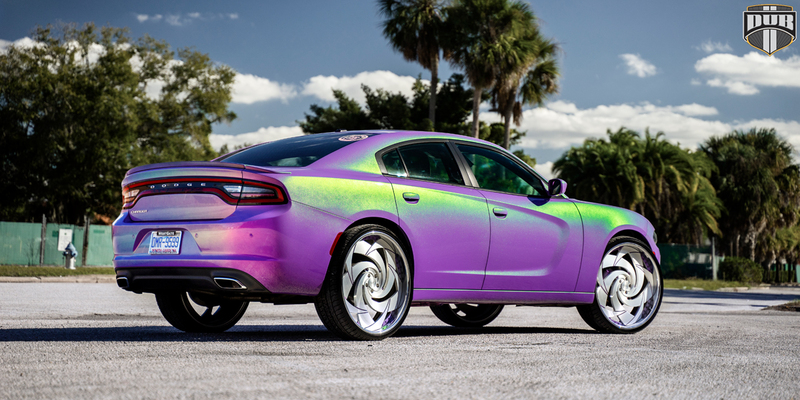 This Dodge Charger on DUB Wheels is Electric! Learn How to do a Fake Burnout with Cheap Rims! 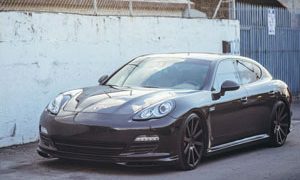 Keep cool with this Porsche Panamera on DUB Wheels! This Mercedes-AMG C63 S is German Muscle on Rotiform Wheels! Drop Bombs with this Ford Mustang on Niche Wheels!